Bettina Campolucci Bordi​’s light and fruity recipe is the mid-winter respite we need right now. If you’re feeling those pesky mid-winter doldrums start to kick in right about now, you’re not alone. And while we know one recipe could never make the blahs vanish completely, this vibrant, three-ingredient mousse from Bettina Campolucci Bordi​’s cookbook Happy Food will at least make you feel for a moment like it’s warm out again. Made from fresh mango, coconut oil and real vanilla, it’s a light and fruity dessert that only requires a few minutes of prep. It’s also freezable, which means you can whip up a big batch in anticipation of your next dinner party, or simply to have on hand for when you’re craving something sweet (or sunny). I first made this dish in Zanzibar when I had access to very good juicy mangoes and homemade coconut oil. Now I get to share the goodness with all of you. Add all the mousse ingredients to a high-speed blender and blitz until well incorporated. The oil needs to completely emulsify with the mango, so make sure there are no white dots in the mix but it’s just a beautiful orange colour. Pour into individual glasses and let the mousse set in the fridge for 3 hours. 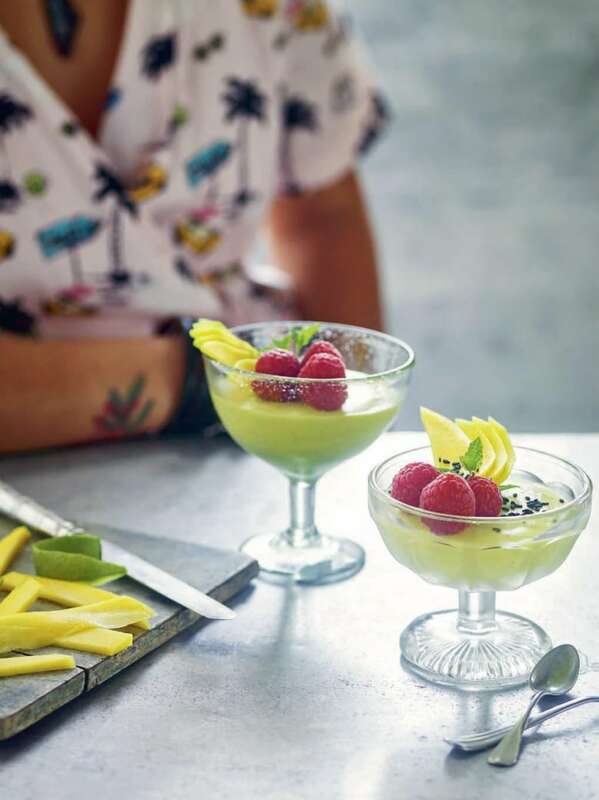 Once set, top with fresh mango slices, raspberries, mint leaves and sprinkles of black sesame seeds for colour and crunch. Excerpted from Happy Food by Bettina Campolucci Bordi. Recipes copyright © 2018. Excerpted by permission of Hardie Grant Books. All rights reserved.